Cleveland’s world renowned Cavani Quartet made a special appearance at Adrian Elementary on Tuesday, May 7th, as part of their Team Up with Music program. The innovative and interactive program is geared toward students in grades 3-5 and involves a close, interactive experience with the performers. As part of the presentation, students were given the opportunity to not only listen to the critically acclaimed quartet play selections of classical and modern music, but also learn more about how playing music, much like sports, involves teamwork. 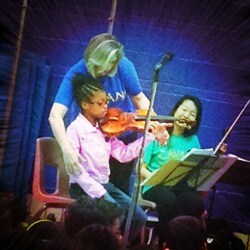 In addition, students also had the opportunity to interact with the performers, and in the case of third grader Kayla Smith, learn how to properly hold and play the violin! Adrian Elementary wishes to thank the Cavani Quartet for their fun, informative, and inspiring performance! The Quartet-in-Residence at the Cleveland Institute of Music since 1988, the Cavani Quartet is named after a famous violin designer, and has performed at locations throughout the world. Its members include Annie Fullard, violin, Mari Sato, violin, Kirsten Docter, viola, and Merry Peckham, cello.